The Republican-induced shutdown of the federal government underscores the Right’s populist contempt for the nation’s democratic institutions. But the fiasco also has undercut America’s standing in the world and thus undermines U.S. security and global leadership, writes ex-CIA analyst Paul R. Pillar. The outrageous shutdown of the federal government’s operations has multitudinous effects on foreign relations and national security. Some of the effects are easy to see. Others are less discernible or measurable but may over the long term be more important. Most apparent are the direct effects of work not being done because it takes money that has not been appropriated or would have been done by federal employees who have been laid off. Sometimes this is clearly visible in the form of things such as presidential trips abroad being curtailed. Even this category of consequences, however, goes beyond what is immediately visible and what can easily be counted right away as an opportunity that would otherwise have been seized or a calamity that would otherwise have been avoided. 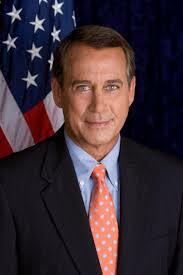 House Speaker John Boehner, R-Ohio, who has demanded various concessions from President Barack Obama in exchange for reopening the government and averting a default on the nation’s credit. Much of the work of people in the State Department, the Department of Defense, the intelligence community and elsewhere in the government cannot be counted that way even though it is important in contributing to the seizing of opportunities, the avoiding of calamities, and other ways of advancing the national interest. It is work that builds long-term foundations for advancing those interests, maintains preparedness to deal with the unexpected, or contributes to knowledge and information that can be acted upon in the future. This aspect of what federal personnel do, day-in and day-out, is insufficiently understood. Much public discussion of counterterrorism, for example, is couched in terms of how many terrorist plots have, or have not, been foiled lately. In fact, most of the work of officials in the counterterrorist community does not consist of detecting and foiling ongoing plots. It is nonetheless work that is critical to developing the knowledge of terrorists and terrorist networks that makes possible the preventing or foiling of plots. If the shutdown has a cost in the form of anti-U.S. terrorism, it will less likely be seen in the form of attacks that occur during the shutdown than in ones that take place later. A more general impact of the shutdown concerns how it may shape the attitudes of foreign governments about dealing with the United States. A concern that commentators already have expressed is that there will be increased reluctance of foreign states to negotiate agreements and commitments with a government whose own house is so out of order. The concern is valid. It represents a cost that may be substantial in the form of lost opportunities for the United States even though it will be hard to prove conclusively a direct connection between the shutdown, attitudes of foreign governments, and a particular missed opportunity. How the shutdown story ends up will affect how much of this type of harm there will be; if the President can confirm the principle of not caving in to disorderly and extortionate houses, this will help the credibility of the United States as a negotiating partner. Even more general and harder to measure, but ultimately of high importance, are the effects on attitudes not just of foreign governments but of foreign populations, or at least of elites who are sufficiently aware of what is going on in Washington for it to make any difference in their thinking. At stake is the image and standing of the type of political system that the United States, when it is not crippling itself by shutting down its own government, represents. This in turn is important because it affects the political choices foreigners make and the objectives they seek, especially during times of upheaval such as has prevailed in the Middle East for the past three years. U.S. interests are tied to all this in two basic ways. First, when foreigners choose liberal representative democracy this is good for the United States as a matter both of values and of more policy-specific consequences such as those of which the democratic peace theorists speak. Second, the United States has enjoyed standing as the leading and most powerful exemplar of this form of governance. This is a major ingredient of America’s soft power, its attraction for those foreigners who ipso facto are more inclined to associate with it, to emulate it, and to follow its lead. The liberal democratic model has always had competition based on other criteria. Totalitarian regimes have won admiration for making trains run on time. Now in Washington things are not only not running on time but not running at all. Many people in other countries, and this has repeatedly been demonstrated in the Middle East, as well as elsewhere, opt for undemocratic formulas if they see them as more likely to provide services they expect from government, including among other things physical and economic security. When the leading (ostensible) liberal representative democracy shows it cannot provide governmental services, the undemocratic solutions look more attractive by comparison, and the United States loses some of its soft power. Of course, what has led to the shutdown in the United States is not democracy but instead some very undemocratic behavior. The situation was caused by one political element’s decision to pursue its agenda not through democratic methods but instead by threatening to inflict harm on the United States itself. But that distinction may be lost on some foreign observers. The response will be somewhat similar to how many people in the Middle East reacted to the mess in Iraq that followed the U.S. invasion by saying that if that is a birth pang of democracy, they want nothing of it, even though what they were observing was not democracy but instead some of the consequences of an ill-considered military expedition. If there is more of a foreign turn away from democratic models as a result of the situation today in Washington, it will involve a perverse symmetry. Those who brought about this situation have shown that they have so little regard for liberal representative democracy that they place lower priority on maintaining it in the United States than they do on pushing their particular political and policy agenda. This fiasco thus becomes another example of how unseemly behavior in American politics can stimulate echoes of that behavior in other countries. In the past it always seemed that Continuing Resolutions were a legitimate form of compromise. Apparently those days are over. Republicans are now mis-characterizing a Continuing Resolution as a refusal to compromise – essentially, ‘moving the goal posts’, when in fact it IS the compromise. Recent reporting is that Reid and Boehner had reached a backroom agreement back in July to have a “Clean” Continuing Resolution. Reid reluctantly agreed to not demand sequester repeal, and Boehner agreed to do similar and not demand gutting the Affordable Care Act aka ObamaCare, if it came to a repeat showdown over U.S. Government integrity and the Validity of U.S. Debt. Now of course Boehner and the House are backing out of that deal. Republicans seem to have thought they could let the Tea Party back-seat-drive part time, while cluelessly not realizing that the Tea Party would reach over the seat and grab the wheel. I guess this is to be expected, since they’re developing a track record of cluelessness – i.e. ignoring the advanced polling analysis from expert statisticians (such as Nate Silver and others) and believing that some undefined something somewhere would deliver the 2012 presidential election to them. Scholarly advice about the Constitution and the intent of the framers is a great thing, but it’s only the first step in explaining what’s going on here. We’re witnessing a rise in authoritarianism, where facts can’t be explained to these right-wing authoritarian people becuase their ‘facts’ are un-critically received from their chosen authorities, who are chosen based on how closely their authorities agree with their own fear-based exclusive narrow vision of the world. Did I just make that up, ‘cuz I’m ‘lib’ral’? Read the scientific evidence from one of the foremost behavioural scientists in the field of authoritarian personalities, Bob Altemeyer. His book ‘The Authoritarians’ is a free download in PDF format. I think that if you check, you’ll find WE put Saddam Hussein into power. provided him with weapons, and encouraged his adventures…until he stared nationalizing resources. Then, we must also consider the Shah of Iran, Augusto Pinochet, the Iran Contra affair, Ecuador, Honduras, the failed coup against Chavez, and the list goes on and on. Just what liberal democratic model have we ever supported? Obviously, you suppose that your credentials with the agency and your affiliation with a university heavily reliant on government subsidies and grants trumps the facts. Among some, they probably do, but just what audience do you suppose you are playing to? Shutting down subversive activities might be the ONLY good thing Republicans have ever accomplished. But the only thing really shut down are programs which benefit the poor and helpless here at home. Any moron knows that the National Security State is still wide open for business.